This study examines the relationship between work-related basic need satisfaction and work engagement. Data were obtained from a total of 203 academics who are employed in various universities of Turkey. In this research Work-Related Basic Need Satisfaction Scale and The Turkish Form of Utrecht Work Engagement Scale were utilized. The data were analysed through multiple regression and Pearson product-moment correlation coefficient analysis methods. The findings revealed that the sub-dimensions of work-related basic need satisfaction significantly predicted work engagement. Upper management should improve work conditions of their personnel, which are related with competency, autonomy, and relatedness needs of academics. This way, academic staff will have better efficiency in terms of work engagement, which will also result in higher work adaptation and participation. Keywords: academic staff, basic need satisfaction, work engagement. The concept of basic psychological needs is regarded as a significant predictor of individual function in life (Van den Broeck, Vanteenkiste, De Witte, Soenens & Lens, 2010). Basic need satisfaction has a close association with the self-determination theory (SDT). Van den Broeck, Vansteenkiste, De Witte and Lens (2008) imply that within the SDT, basic psychological needs are defined as the nutrients needed by humans to fulfil their potentials and maintain their growth, integrity and health. According to the SDT researchers, basic psychological needs are determined as follows: Autonomy, belongingness (relatedness), and competence. These are inherent psychological needs. The need for autonomy refers to one's willpower, and desire to act freely in accordance with one's own interests and values. The need for belongingness (relatedness) implies one's need to interact, connect to and care for other people. The need for competence is one's having a sense of effectiveness while doing something (Deci & Vansteenkiste, 2004). In the light of the SDT, Sheldon and Schüler (2011) argue that the feelings of autonomy, belongingness and competence lead to positive feelings especially when we accomplish, produce or succeed at something, experience a close relationship with another person, and become autonomous and self-regulating. These positive feelings "reinforce attainment of natural affiliation and achievement incentives, respectively" (Sheldon & Schüler, 2011:1107). SDT theory also implies that for goal pursuit and success, people's basic psychological needs should be satisfied. The concept of needs is related to the content of motivation which forms a basis for the "energization and direction of action" (Deci & Ryan, 2000:227). There are studies that investigate the basic psychological need satisfaction in relation to different variables. For example Andreassen, Hetland and Pallesen (2010) studied how the variables of workaholism, basic need satisfaction at work and personality are related. Andreassen et al. (2010) benefited from the Self-determination Theory and worked with a sample of 661 Norwegian employees. The researchers found that satisfaction at work had positive relationship to Enjoyment of Work, but negative relationship to Drive. Conscientiousness was found to have a positive relationship to all 'workhaholism' components: Extraversion and Openness to Work Involvement and Enjoyment of Work and Neuroticism to Drive. However, negative correlations were found between Neuroticism and Enjoyment of Work, and Agreeableness and Drive. Çankaya (2009) benefited from the model of self-determination and examined the relationship between autonomy support, basic psychological need satisfaction and subjective well-being. The findings of the research were as follows: 1. Support for autonomy has a direct and positive influence on needs satisfaction, 2. Satisfaction of individuals' basic psychological needs has a direct and positive influence on their level of self-esteem, 3. Satisfaction of individuals' basic psychological needs has a direct and positive influence on their level of anxiety, 4. Satisfaction of individuals' basic psychological needs has a direct and positive influence on their level of satisfaction with life. The research also showed that the autonomy the individuals got from their family and friends has a direct and positive influence on their basic psychological needs (Çankaya, 2009:30). Gillison, Standage and Skevington (2008), using self-determination theory, investigated how students' quality of life and psychological need satisfaction changed after they moved to secondary school. The findings revealed that satisfaction of the needs for autonomy and belongingness predicted improvements in the quality of life. Yet competence did not predict improvements in the quality of life. The issue of work engagement has also received a considerable attention in the field of organizational behaviour. Kahn (1990) defines work engagement as the "expression of a person's preferred self during tasks that promote connections to work and to others, personal presence and active, full performances" (cited in Babcock-Roberson & Strickland, 2010:315). Work engagement has a close relationship between job performance and organizational commitment. Current research studies have come up with the results that work engagement is closely associated to burnout and turnover intentions and leadership qualities in the workplace. For example Du Plooy and Roodt (2010) found that work engagement and burn-out were significant predictors of turnover intentions. Hassan and Ahmed (2011) studied the contribution of authentic leadership to subordinates' trust in leadership and how this, in turn, predicted subordinates' work engagement. The findings revelaed that authentic leadership improved subordinates' trust in leaders, and contributed to work engagement. The above research studies give us an insight that individuals' psychological basic need satisfaction may also be a significant predictor for their work engagement which may help them accomplish full performances in the workplace. However the researcher came across with few research that has examined the relations between work-related basic need satisfaction and work engagement. Van den Broeck et. al (2010), due to the lack of a valid and reliable measure of need satisfaction in the field of organizational psychology, developed and validated a "Work-Related Basic Need Satisfaction Scale" for future research and practice. Before the construction of this scale the same researchers examined the relationship between basic need satisfaction and the main ingredients of burnout and engegament, which are job demands, job resources, and employees' exhaustion and vigour. The study showed that satisfaction of basic psychological needs partially explained the relationships from job demands to exhaustion and from job resources to vigour. Vansteenkiste, Neyrinck, Niemiec, Soenens, De Witte and Van den Broeck (2007), using the self-determination theory approach, conducted two studies to investigate the correlation between work value orientations, psychological need satisfaction and job outcomes. The two studies revealed that having an extrinsic work value orientation, relative to an intrinsic work value orientation was related to less positive outcomes but more negative outcomes. Study 2 showed that having an extrinsic work value orientation, relative to an intrinsic work value orientation gave harm to employees' job outcomes. That is, these orientations hindered "the satisfaction of the basic psychological needs for autonomy, competence and relatedness at work" (Vansteenkiste et al., 2007:251). In the global world like other organizations higher education institutions are also changing. These changes make organizations keep track of social, cultural, political and technological systems. Higher education institutions need to ensure quality by improving their processes such as communication, planning, problem-solving, leadership, decision making and so on. For quality of education staff members should also be motivated to take part in participatory and teamwork for the establishment of organizational goals and objectives (Maguad & Krone, 2012). Turkey is a candidate country for European Union membership. Therefore, Turkish Higher Education system participated in the Bologna Process in 2001. Since then the higher education institutions in Turkey "has gone into a serious re-structuring and development processes" (Furuzan, 2012:107) in order to elevate these institutions to the standards of the higher education instititutions in Europe. Furthermore and firstly, higher education attracted considerable investments during the last two decades in Turkey. Many private and foundation universities (more than 100) have been launched since 1990s. Contribution of the academic staff to the advancement of the Turkish higher education system has also been documented in relevant literature (Katircioglu, 2010). Large increases in the number of higher education institutions raised strong competition not only in Turkey but also in the regions of the Middle East and the Mediterranean. Emergence of too many universities during the last two decades and recent reform iniatives such as "degree recognition, quality assurance, qualification framework, and a new accreditation system" (Furuzan, 2012:108) also emphasized the agenda of student and staff/academics satisfaction and quality education concepts. The researcher of the present study believe that for better work engagement of the university staff in these reform initiatives as part of the Bologna process, it is important that their work-related basic needs are also satisfied. So that they can come together for the establishment of the common goals and objectives of their universities. This study aims to examine the relationship between work-related basic need satisfaction and work engagement. The constructs of work-related basic needs satisfaction and work engagement are mostly studied in organisational context (Imamoglu & Beydogan, 2011; Babcock-Roberson & Strickland, 2010; Otken & Erben, 2010; Van den Broeck et al., 2008; Bakker & Bal, 2010) rather than educational context. The researcher came across with only one study (Dogan & Eryilmaz, 2012b) that examines work-related basic need satisfaction and subjective well-being in educational context (among academicians) in Turkey. Since studies that investigate the relationship between the above-mentioned variables in the context of higher education institutions are limited, the researcher thinks that this study will have a great contribution to the relevant literature. In total, 203 (94 female/109 male) academics from 86 universities in Turkey have participated in this study. These universities were selected from seven different geographical regions (Aegen, Black Sea, Central Anatolia, Eastern Anatolia, Marmara, Mediterranean and Southeastern Anatolia) of Turkey. Random sampling was used as a sampling strategy "to ensure the characteristics of the subjects to appear in the same proportion they appear in the total population" (Bogdan & Biklen, 1998:65). The data collection instruments were sent to randomly selected 1800 academicians via mail. However, only 203 of them responded. The age range of the participants was 22 to 65. The average age was 40,95. Regarding the academic status of the participants, 25 of them were teaching assistants, 53 lecturers, 54 assistant professors, 35 associate professors and 36 professors. Regarding their maritial status, of the 203 participants, 46 were single, 146 were married and 11 were divorced. Work-Related Basic Need Satisfaction Scale (W-BNS): The scale was developed by Van den Broeck et al. (2010). The scale contains 18 items, and is a 5-point Likert-type. W-BNS has three sub-dimensions: competency need, relatedness need and autonomy need. The "competency need" sub-dimension implies individiual's feeling himself/herself competent at work (Sample Item: I feel competent in my job). The "relatedness need" sub-dimension implies individiual's need to build relationships with others and to avoid loneliness and isolation at work (Sample Item: At work I feel part of a group). The "autonomy need" sub-dimension is related to individual's initiating activities, making decisions and choices independently at work (Sample Item: I feel free to do my job the way I think it could best be done). Factor analysis should be carried out for the suitability of sample and instrument used in the study prior to further analyses. These analyses are also available in the education literature (Bukova-Güzel, Cantürk-Günhan, Kula, Özgür & Elçí, 2013; Katircioglu, Fethi, Unlucan & Dalci, 2011). The item loading factors of the scale were found in scores ranging from .58 to .85. The goodness-of-fit (GFI) indexes obtained for the two-factor model were reported as x2/standard deviation (SD) = 1.8, Comparative Fit Index (CFI) = 98, The Root Mean Square Error of Approximation (RMSEA) = 0.4. The reliability of the scale was calculated as .85 for the "competency need", .82 for the "relatedness need" and .82 for the "autonomy need." The W-BNS scale was adapted into Turkish by Dogan and Eryilmaz (2012a ). The construct validity was measured by Confirmatory Factor Analysis (CHA). The goodness-of-fit indexes revealed by CHA showed that three factor structure was protected in the sample of Turkish employees (χ2 = 321.23, SD = 132, X2/SD = 2.43, Goodness of Fit Index (GFI) = 0.91, Normed Fit Index (NFI) = 0.90, Incremental Fit Index (IFI = 0.94, Adjusted Goodness of Fit Index (AGFI) = 0.89, RMSEA = 0.062, The Root Mean Square Residual (RMR) = 0.056). The internal consistency coefficients for "competency need", "relatedness need" and "autonomy need were found to be .70, .78, .69, respectively. The Turkish Form of Utrecht Work Engagement Scale (UWES-TR): UWES was developed by Schaufeli, Salanova, Roma and Bakker (2002) to measure the work engagement of employees. UWES is a 17 item, 5-point Likert, self-report type of scale. The items are scored as "I strongly disagree" (1), "I disagree" (2), "I agree a little" (3), "I agree" (4), "I strongly agree" (5). There are reverse coded items in the scale. The high scores obtained from the scale show high work engagement. The scale has three dimensions: Vigour, Dedication and Absorption. The internal reliability consitency scores for the sub-dimensions were obtained as .80, .91, and .75, respectively. The Turkish adaptation of the scale was carried out by Eryilmaz and Dogan (2012). The goodness fix indexes revealed by confirmatory factor analysis confirmed the three factor structure of the scale with the sample of Turkish employees (X2/SD = 3.59, GFI = 0.81, CFI = 0.96, NFI = 0.94, IFI = 0.96, The Root Mean Square Acceleration (RMSA) = 0.11). The internal consistency coefficent of UWES-TR for "Vigour," "Dedication," "Absorption" was found to be .94, .88, and .87, respectively. Demographic Information Form: This form was prepared to elicit demographic information about the participants. The form consists of four questions related to age, gender, maritial status and academic status. This research contains statistical procedures in order to predict work engagement in the Turkish universities. Therefore, in addition to descriptive analysis, pearson correlation and multiple regression analyses have been employed in the study. There are studies that employ pearson correlation and regression analyses in the education literature; among them are Grosser and Nel (2013) and Bukova-Güzel et al. (2013). The dependent variable of this study is work-engagement and the independent variable of the study is work-related basic need satisfaction with the subdimensions of "competency need", "relatedness need" and "autonomy need." The correlation between the variables was calculated by Pearson Correlation Coefficient. Multiple regression analysis was conducted to determine to what extent the independent variable predicted the dependent variable. Descriptive statistics were also used for the variables in the study. The scales do not have cut-off scores since the scales were not norm-referenced. In this section results from the empirical analysis are discussed. The section will be finalized by correlation and regression analyses. Table 1 shows that the lowest mean score regarding the competency need sub-dimension is 1.67, the highest mean score is 5.00 and the average mean score is 4.31. The minimum score regarding the relatedness need sub-dimension is 1.67, the maximum score is 5.00, and the mean score of the sub-scale is 3.70. The minimum mean score regarding the autonomy need sub-dimension is 1.33, the maximum score is 5.00 and the mean score of the sub-scale is 3.50. The minimum score regarding the W-BNS Total is 2.11, the maximum score is 4.83 and the total mean score is 3.80. The minimum score regarding work engagement is 1.35, the maximum score is 5.00 and the mean score is 4.01. Table 1 presents descriptive statistics regarding four major dimensions of the research instrument. The correlation between dependent and independent variables were calculated by Pearson Correlation Coefficent and are presented in Table 2. It is clearly seen that that there is a significant and positive correlation (p < .001) among the four dimensions of the study. The highest correlation was obtained between competency need and work engagement (correlation coefficient (r) = .64) which implies that these two dimensions are positively associated at .001 significance level. The multiple regression analysis will be now carried out in the next step. Results are presented in Table 3. Multiple regression analysis was conducted to determine to what extent work-related basic need satisfaction with the subdimesions of competency need, relatedness need and autonomy need predict work engagement. Looking at the Table 3, it can be seen that the sub-dimensions of the work-related basic need satisfaction are significant predictors of work engagement R = 0.74, R2 = 0.55, Analysis of Variance (F) = 81.65, p < .001). When the relationships of the variables with work-engagement were evaluated one by one, it was seen that the "competency need" was the highest meaningful predictor of work engagement (β = .47; p = .000). The second highest meaningful predictor of work engagement was "autonomy need" (β = .33; p = .000). 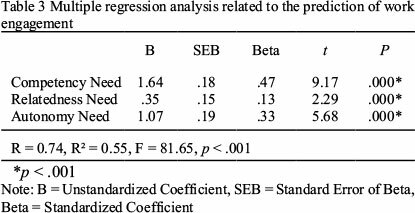 The lowest meaningful predictor of work engagement was found to be "relatedness need" (β = .13; p = .000). These results reveal that variation in the related dimensions of Table 3 explain 55% of variation in the work engagement. The cut-off criteria for determining the extent to which there is a multi-collinearity between the predictor factors utilized in regression analysis was related to the poor discriminant validity (Brown, 2006). The evidence, which signifies whether there is a poor discrimination between the predictor factors is that the correlations between the predictor factors must not exceed the determined cutoff point of .85 (Brown, 2006; Kline, 2005). In the present study, the correlations between the predictor factors are found to be below the cutoff point of .85 (see Table 2). This shows that there is no multi-collinearity between the predictor factors. The present study aims to examine to what extent work-related basic need satisfaction predicted work engagement among the academic staff in Turkey. The results revealed a significant and positive association between the predictive variables of "competency need," "autonomy need" and "relatedness need" and the dependent variable of "work engagement". The results also revealed that these variables significantly predicted "work engagement"; that is, competency need, autonomy need, and relatedness need exerted positive and significant impact on work engagement. The Bologna Process is considered by "policy makers, university leaders, academic staff, students and researchers as the most important development of higher education in Europe today" (Vlasceanu & Voicu, 2006:25). As Turkey is part of this process, higher education institutions are involved in serious reform initiatives in order to elevate their standards to those of the European higher education. Universities in their efforts to develop their quality assurance system, are moving into "greater institutional autonomy" accountable for decisions, personnel recruitment, budget, student admission, educational forms and content (Gvaramadze, 2008:443). In this new culture of quality, students, university staff and other stakeholders should participate in the decision-making process. The present study is concerned only with academics as stakeholders of higher education institutions in Turkey. The researcher believes that for efficiency and better engagement in the reform initiatives, university staff should be motivated and their work-related basic needs should be satisfied. In self-determination theory, the concept of basic need satisfaction defines three basic needs: the needs for autonomy, competence, and relatedness. These are important determinants that influence motivational mechanism of individuals. Autonomy implies psychological freedom when individuals carry out an activity and organize their work. Competence is individuals' desires to feel effective when they explore and manipulate the environment and engage in challenging tasks. Relatedness implies individuals' need to feel connected, be part of a group, love and care and be loved and appreciated (Van den Broeck et al., 2010). With respect to the organizational context, it is logical to suggest that the basic psychological needs of individuals influence their performances in the workplace. Yet, the lack of a work-related basic need satisfaction measure before Van den Broeck et al. (2010) constructed and validated it, did not foster studies that examined the direct relationship between basic satisfaction need and work-engagement. From the limited literature related to the relationship between basic satisfaction need and work engagement especially in the university context, it could be said that psychological need plays an important role in job outcomes. Satisfaction of basic psychological needs have an effect on individuals' feelings and job outcomes (Vansteenkiste et al., 2007; Van den Broeck et al., 2008). Basic psychological needs also explain employees' condition at work such as burnout and well being. (Van den Broeck et al., 2008). Bakker and Bal's study (2010) conducted with 54 Dutch teachers showed that low-levels autonomy, exchange with the supervisor and opportunities for improvement had positive correlation with weekly engagement. The multiple regression analysis in the present study showed that variation in the competency need, the autonomy need and the relatedness need explained 55% of the variation in work engagement. These findings provided evidence that work-related basic need satisfaction significantly predicted work engagement. The variables of competency, autonomy and relatedness needs positively influenced work engagement of individuals. The only study that was conducted among academicians in Turkey also showed that work-related basic need satisfaction significantly explained subjective well being of the academics (Dogan & Eryilmaz, 2012b). It can be said that this study somehow supports the findings of the present research. The research studies show that well-being of academics influence their creativity, energy, communication and productiveness at the workplace (Diener & Chan, 2011; Lyubomirsky, King & Diener, 2005 cited in Dogan & Eryilmaz, 2012b). Results of the present research have important implications for the university administration since these three dimensions have statistically significant and positive impact on work engagement. Upper management should improve work conditions of their personnel, which are related with competency, autonomy, and relatedness needs of academics. This way, universities will have better efficiency in terms of work engagement, which will also result in higher work adaptation and participation. The findings of McCloskey's study also showed that employee's autonomy and social integration levels were related with "their degree of job satisfaction, work motivation, and commitment to their organization" (McCLoskey, 1990 cited in Imamoğlu & Beydoğan, 2011:289). There are limitations of this study. This study has a relatively small sample size. This study was carried out with only academics. In addition to academics, other stakeholders of universities such as students, service personnel and managerial staff can be included to enlarge the sample. This study can be replicated by including participants from public and private organizations. The results of the present study can be compared with those of other organizations. Further, other variables such as burnout, turnover (Van den Broeck et al., 2008, Du Plooy & Roodt, 2010), individual personality (Andreassen et al., 2010) can also be examined together with the variables of basic psychological needs and work-engagement.